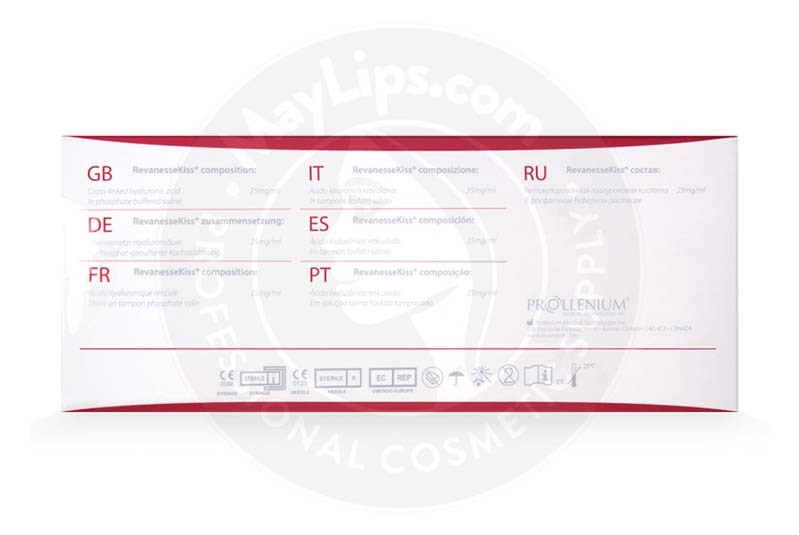 Revanesse Kiss is an aesthetic solution created and distributed by Canadian pharmaceutical company Prollenium Medical Technologies for the purpose of augmenting the lips. It consists of 25mg/mL of artificial hyaluronic acid, which is cross-linked using Thixofix Technology. This patented manufacturing process ensures that the gel is highly viscous yet smooth enough to be injected using fine gauge needles. Despite it being synthetic, the gel is bioresorbable and delivers natural looking results. 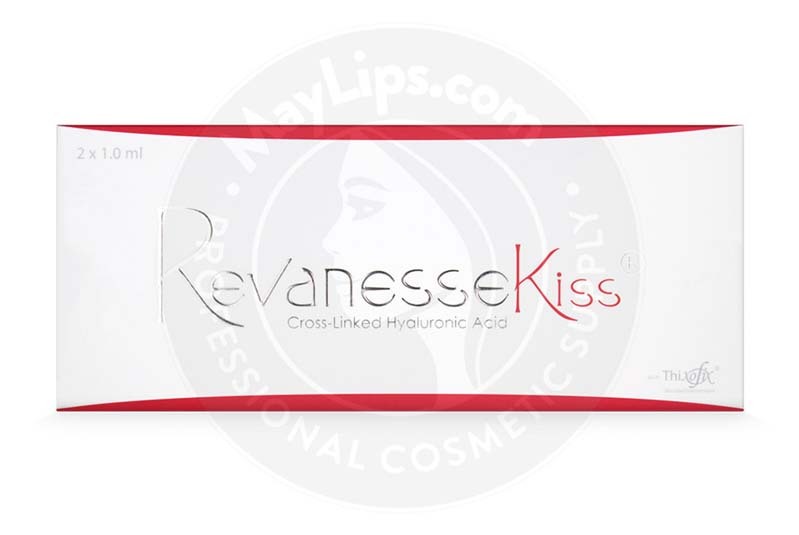 It is packaged in a 1mL syringe and each box of Revanesse Kiss comes with 2 preloaded syringes, fine gauge sterilised needles, and a product pamphlet. Revanesse Kiss is a volumising lip filler that is used to plump and define thin lips. The monophasic gel can be easily molded to deliver desirable improvements to the shape and size of the lips with minimal incidences of swelling. How does this lip filler work? The sensitive tissue of the lips is made up of only 5 to 6 layers of cell structures while the rest of the face is, on average, composed of up to 16 layers of cell structures. The shape and size of an individual’s lips are primarily influenced by genetics and ethnicity, though they do alter with age and lifestyle habits. As the body ages, important structural molecules like collagen and hyaluronic acid diminish in quality and quantity, resulting in the thinning of the lips. Even without the ageing process, some people are born with naturally-thin lips that they may wish to augment. No matter the causative factors, thin and undefined lips may prove to be frustrating and unappealing for some people. Revanesse Kiss is a lip volumising gel made of non animal-based hyaluronic acid. The hyaluronic acid molecules are derived through a biofermentation process and further processed using Thixofix Technology. This original manufacturing method ensures that the lip plumping gel is highly viscous yet smooth enough to be injected using very fine gauge needles. The gel is also elastic enough to be molded according to the patient’s preference. In addition, it is very durable and can withstand extensive movements of the mouth without breaking down prematurely. Patients can enjoy well-sculpted and plump lips with this lip filler. Lip augmentations are considered medical procedures since they do involve minimally invasive injections. Therefore only experienced and skilled physicians specialising in aesthetic treatments are legally permitted to conduct this procedure. A patient’s suitability for receiving hyaluronic acid-based filler injections must be determined by thoroughly reviewing their medical history (e.g. existing medical conditions and supplements and medication taken). Once they are deemed suitable, prepare them for the procedure by explaining the possible intended and mild unintended side effects that they might experience. Just before procedure, clean and disinfect the mouth region as part of aseptic guidelines. Assess their need for pain relievers and administer accordingly. Set up the medical device by attaching the provided needle to the preloaded syringe. Inject the volumising gel into the lips, but do not overcorrect. Once the lips have been augmented to the desired shape and size, discard any remaining gel and used needles. Refer to the product pamphlet for more information on usage instructions and precautions. Revanesse Kiss is processed using proprietary Thixofix Technology, which forms a viscoelastic and monophasic filler gel. The gel can then be molded easily, and once injected, it resists breaking down and retains its shape. In fact, this lip volumiser can last for about 6 months before being resorbed into the surrounding tissues. However, the duration of effects varies on an individual basis. Patients can get more injections once the plumping effects wear off. Refer to the product pamphlet for more information on the list of contraindications. Patients might notice a few inflammatory reactions on treated areas, all of which are associated with the injection process itself. However, assure your clients that these reactions are very mild in nature and should resolve within a week. Refer to the product pamphlet for more information on the list of side effects. Revanesse Kiss contains 25mg/mL of artificial hyaluronic acid, which is cross-linked using special Thixofix Technology. The resulting gel is highly viscoelastic and is capable of resisting early degradation caused by frequent mouth movements. The syringe has been ergonomically designed to provide comfort for medical practitioners who conduct the procedure. 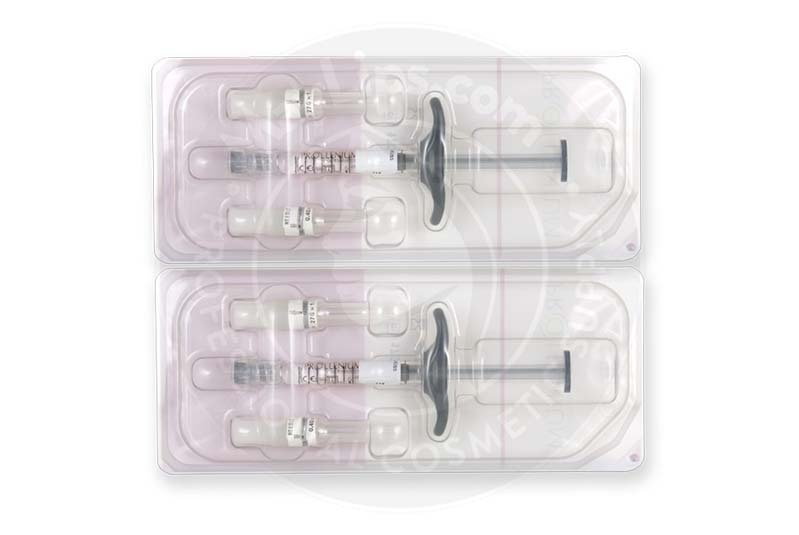 The syringe has extra wide flanges and wide pistons for better ease of use.